One night in August about five years ago, a friend and I decided to cook slow fast food. On our menu were hamburgers, fries, Waldorf salad, mayonnaise and ketchup, which we’d make from scratch. I lived in Belgium at the time, and consequently, my friend and I had mastered the art of making mayonnaise, each with a distinct role in the process. I was the pourer; he the stirrer. But we had never made ketchup before. We’d been preparing stuff all day. The hamburger buns had risen beautifully and were ready to be baked. The burgers were waiting to be grilled. Our mayonnaise was soft and creamy, and a tomato mixture was simmering away on the stove. It all smelled great, right until the minute the first person arrived. Our bright red soon-to-be ketchup suddenly turned brown and gave off a putrid scent. “God, what is that smell?” she said. We sent her out to buy a bottle of Heinz and threw out the tomato sauce. When the summer was over, I moved back to Amsterdam and started working with Jan Hein, a university teacher and self-taught programmer. He designs curriculum to teach humanities students how to code. We soon bonded over a shared enthusiasm and frustration of making ketchup at home. I discovered that tomatoes used to be called love apples. It took a few years, but our story turned out to be a love story too. We started dating and got engaged last summer. Yet, I never tried to make ketchup again until now. As I’m writing this, my first batch of ketchup is bubbling on the stove. It still smells good. Caveach, escaveche, escabeche, escaveach, iskebêy, caveach, kitjap, kecap, fan-kei cheop, kê-tsiap: the etymology of ketchup is as diverse and uncertain as its origins. Some claim ketchup is derived from pickles used to preserve fish, while others claim its ancestry is East Asian, or more precisely, Indonesian. 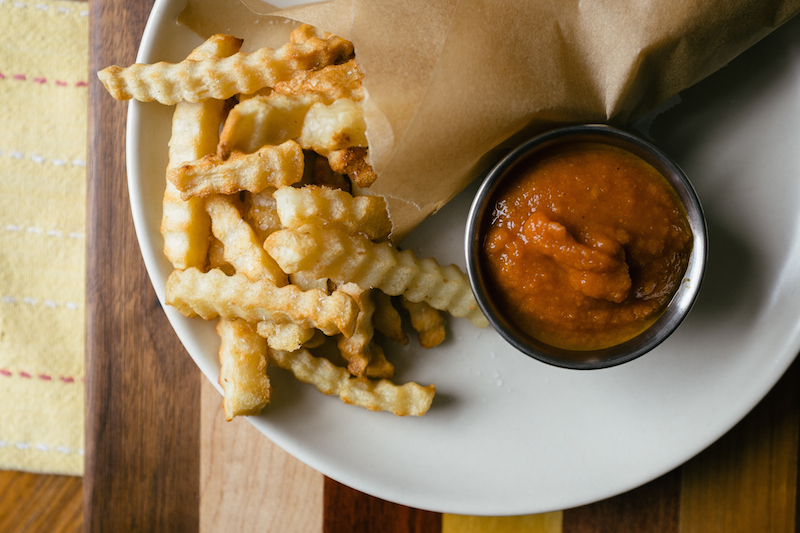 “Ketchup” would be derived from “kecap,” which means sauce. The ketchup we know today is sweet and uniform, and mostly by Heinz, who has a market share of 60 percent. “Old” ketchup was never uniform and was therefore very hard to produce on an industrial scale. But a few things have changed over the course of two centuries. Ever since the benzoate war, ketchup’s big historical landmark, the condiment has balanced our five fundamental tastes. The most important changes are increased amounts of sugar and vinegar, and the use of ripe tomatoes instead of young ones. Ripe tomatoes are rich in umami, our fifth flavour component. Tomato ketchup has always been salty and bitter, but with the added sugar and vinegar, our sweet and sour receptors jump with joy. A recipe for success. As the culinary curious attempt to make more things at home—from growing produce on a fire escape to making sourdough bread—ketchup makes its return to DIY-cooking too. Ketchups are increasingly made with other ingredients besides tomatoes, from cranberries to cabbage to carrots. This movement is both historical (the fish, walnuts and mushrooms) and contemporary, given our increasing concern with local and sustainable farming. Tomatoes are a soil-depleting crop, which means they require a lot of nutrition to grow relative to their yield. They’re also a seasonal fruit, and apart from a few months each year, they usually travel a few thousand miles before ending up in my market. Depending on where you live, there are other crops that grow with ease and abundance that you can use to make ketchups, including red cabbage and beets. To start with the basics, I followed Gourmet’s recipe for tomato ketchup. My friend said the ketchup is great on everything from fries to grilled cheese, but it was too sweet for my taste, so I cut the sugar down quite a bit. 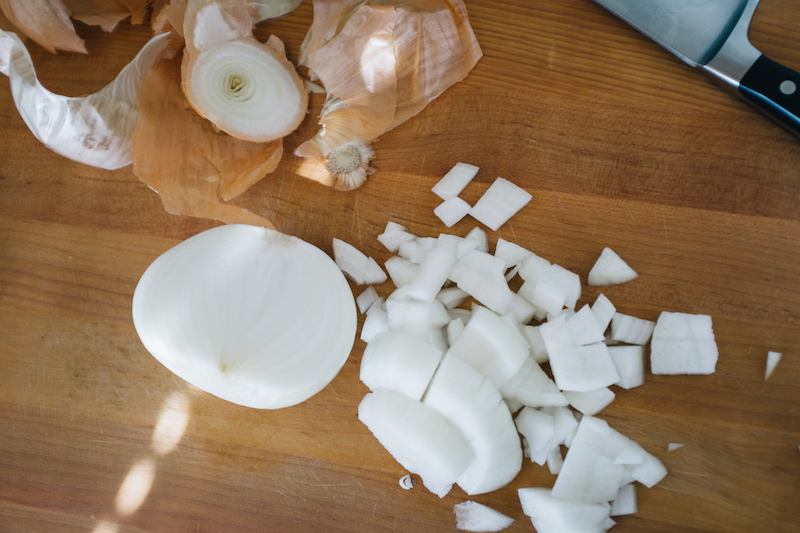 To make the ketchup, start by sautéing and softening the onions in a medium saucepan. Mix in the other ingredients and bring the sauce to a boil. Simmer on low uncovered for several hours, until very thick, and then purée. For an extra fishy umami ketchup, pound 5 anchovies into a paste, and add them to Gourmet’s Homemade Tomato Ketchup’s recipe with 2 teaspoons of tamari, worcester sauce and oyster sauce. Yum, yum, yum. For a tangier ketchup, mix in a tablespoon of curry power, a pinch of ground allspice, and a pinch of ground cloves. 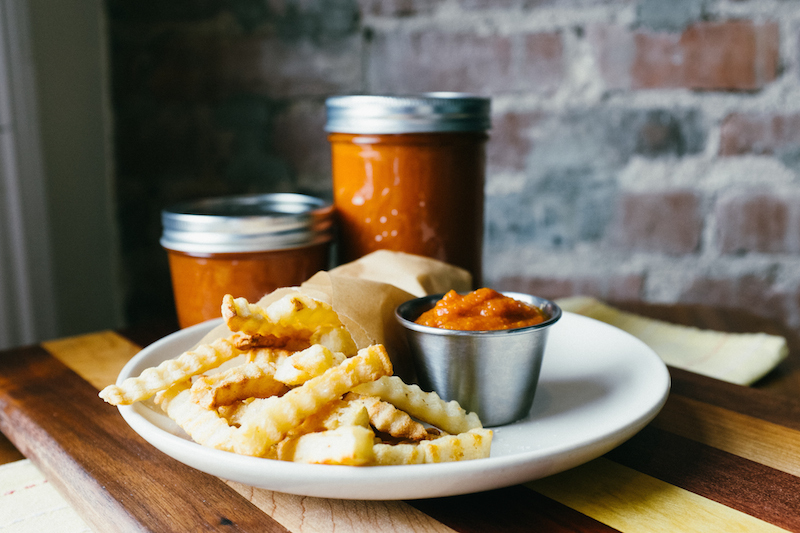 This ketchup is inspired by Dan Barber’s article in Time Magazine, Cook with the Whole Farm. The dollop of sauce on the plate is supposedly red cabbage ketchup. There’s no recipe, so I let all the ingredients simmer and then puréed it. While the sauce is sweet and spiced, the texture is a tad grainy for ketchup. Still, it’s a great sauce for meatballs! Beets have a gorgeous color and are cheap and available where I live throughout most of the year. Carrie Fehr’s recipe for beet ketchup gives you a rich, dark and sweet sauce that’s great on chicken or turkey burgers. I ran out of balsamic vinegar, so I used 1¼ cup and ⅔ cup of honey, which was good because I wanted to bump up the percentage of beets a bit. Sautée and soften the onions. Mix in the remaining ingredients and let them simmer, uncovered, for about an hour, or until reduced by half. Remove the spices and then purée. It should be thick, smooth and shiny. For an extra kick, add some grated horseradish. I recommend eating the ketchup with regular fries instead of sweet potato ones, and it’s also delicious on a piece of leftover steak.